For eight years, Barack Obama worked hand-in-hand with the United Nations to erode America's sovereignty. When Congress refused to pass his agenda, he worked with the UN to make it international law. The result was the UN Arms Trade Treaty, horrible Iran nuclear deal, and the Paris Climate Treaty. All signed without Congressional ratification. Now, the UN is trying to force Trump to stay in all of these anti-American agreements. They are using YOUR tax dollars - given to them by Congress - to block Pres. Trump from putting America first. I am calling on all likeminded Conservatives to join our campaign and force Congress to pull the plug on the United Nations for good! Send your instant FaxBlast and FORCE Congress to pull the UN's funding immediately! For eight years, Barack Obama and the United Nations worked hand in hand to push his agenda forward. On countless occasions, you and your colleagues refused to give then-President Obama what he wanted. Whenever that happened, he turned to executive orders to implement his policies anyway. But he also turned to the United Nations. When he couldn't get gun control passed, he signed onto the UN Arms Trade Treaty without Congressional ratification and began implementing the treaty's requirements by executive fiat. When he couldn't get his global warming policies through Congress, he turned to the UN's Paris Climate Agreement. He signed on without Congressional ratification and sent the United Nations $1 billion of unappropriated taxpayer money. When you and your colleagues refused to sign onto the Iran nuclear deal, Obama sent John Kerry to sign it anyway. Even though Congress never ratified the treaty, he began using it to lift sanctions and funnel billions of dollars to the Iranian regime. None of this was legal. None of this was constitutional. 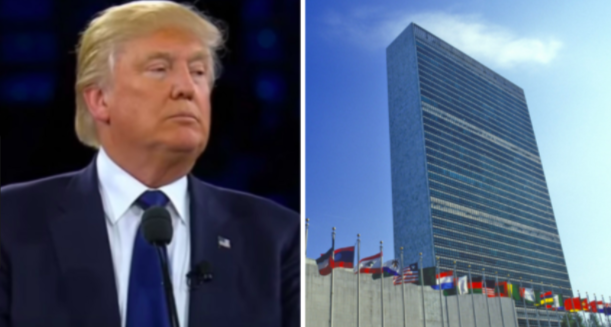 President Trump is working to undo it all, but the United Nations is fighting back. They are using the money that YOU gave them to further erode American sovereignty. Last year, President Trump cut hundreds of millions in donations to the United Nations. While the UN originally bragged that they'd be able to continue on without, they are now coming back to the negotiation table. The only thing these globalists care about is there funding. You need to cut it off. President Trump won on a promise to put America First. The UN continues to use my tax dollars to pursue Obama's "America Last" agenda. You MUST shut it down.